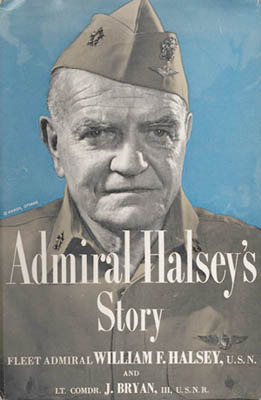 William F. Halsey, Admiral Halsey's Story. New York: McGraw-Hill Book Company, 1947. Presentation copy. Young William F. Halsey really wanted to go to the Naval Academy. His appointment did not come through so Halsey decided to become a Navy doctor and came to Virginia to study medicine in 1899. At the University he flunked two courses, barely passed two others, broke the leg of the star quarterback in a scrimmage before the big game with Georgetown, and scared guests in his room with an anatomy class skeleton propped up in a bedside chair. At the end of his second year, he was finally appointed to the Naval Academy and left for Annapolis and his coveted naval career. By 1941 he was a vice-admiral and commander of the Navy's aircraft battle force. A fueling delay on a routine mission placed his ships at sea on the morning of December 7 and saved them from the devastation at Pearl Harbor. Two days later his small battle force began to hunt down Japanese submarines. They sank their first one the next day. It was only the beginning. Less than two months later he launched morale-boosting attacks against the Japanese in the Marshall and Gilbert Islands, the first big naval offensive of the war. In April of 1942 he maneuvered his ships within 300 miles of the Japanese coast, close enough for Lt. Col. James H. Doolittle to stage a daring raid on major Japanese cities. Over the next three years Halsey and his 3rd fleet pounded the Japanese in legendary battles at the Santa Cruz Islands, Guadalcanal, and Leyte Gulf. On August 29, 1945, he stood by on the deck of his flagship, the U.S.S. Missouri for the Japanese surrender ceremony.